A marriage of flavors made in fruit heaven: Grappleberry by Mad Hatter Juice is a complex blend of juicy blueberry, crisp apple and sweet grape. The combination of flavors works unbelievably well together, creating an all-day vape that fruit vapers need to try. Grappleberry's nic salt formula adds an extra layer of smoothness and satisfaction to your vape. Subjective of course but this is my number 1. The only flavor I can stand on a regular basis. I just love it. Perfect for all day, every day. First off, great taste!! Definitely more grape than anything, kinda reminds me of Hubba Bubba. Only reason it doesn’t get 5 stars is because it took me FOREVER to get this bottle open. I tried everything, even took the childlock part off the top and still couldn’t get it open! I had to end up basically destroying the cap to get it open. Could’ve just been a bad bottle but overall I highly recommend! This one too some getting used to but it grew on me the more I had of it. I love anything grape. I bought two different grape flavors a couple orders ago and reorderd this one because it was so good. This is my favorite ejuice without a doubt. Definitely on the sweeter side, so only get this if you enjoy a sweet tasting smoke. Good flavor profile but quickly loses flavor and becomes flat and flavorless. Grappleberry has great flavor if you are looking for something very sweet. I gave it 4 stars because it won’t be my all day vape. I will keep it in a pod for once in a while. 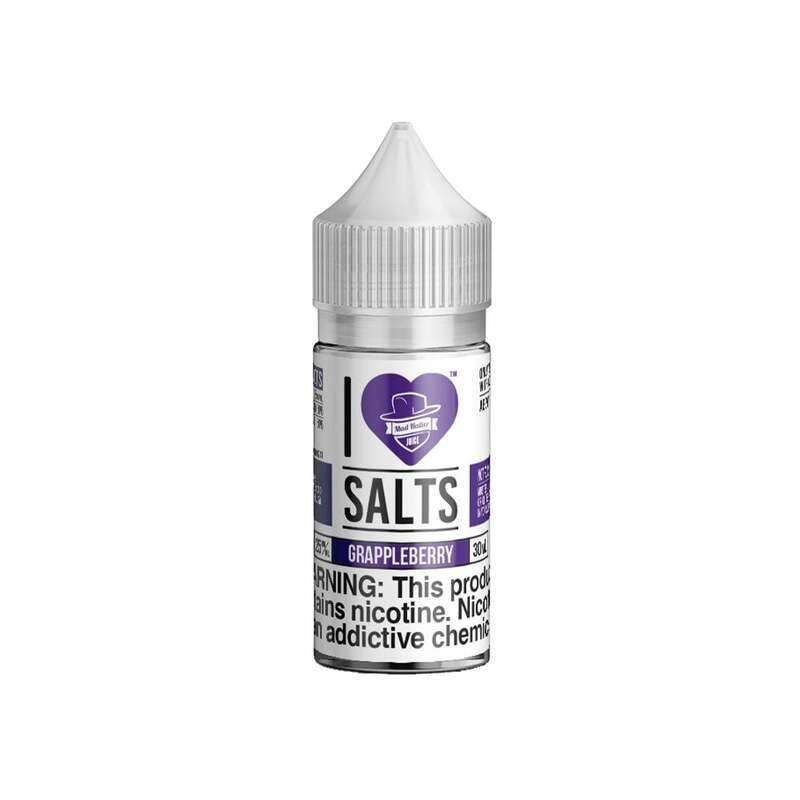 By far my favorite flavor I Love Salts liquid. Didn't come as close to the strawberry and apple mash, but it was smooth and delicious. Was so excited to try this with it having such high reviews. Unfortunately, once I tried it myself it, it reminds me too much of cough syrup. It’s like smoking liquid NyQuil. Had high hopes for this one but was slightly disappointed. I still go back to it every now and then. The flavor is too sweet, so sweet that it almost sticks with you.. proceed with caution. Holy smokes! This was my first time stepping away from tabacco flavored juice. This takes you beyond any of that, and this is clearly my new favorite. This is now my baseline. Anything else will be extra. I will always have these, love me some grapleberry. one of my mods always has this in it. it's the Mrs. favorite too. I bought this for my suorin drop and air. It’s really smooth, I really like it. Will purchase again. This is my favorite salt nic. Kind of tastes like a grape jolly rancher. Plus the price from E.T is $5 cheaper than in a NY vape shope.